Posts tagged "social media calendar"
Social media has become a staple component in not only marketing and promoting your brand, but also in handling communications related to customer service issues. These days customers and potential customers are more inclined to make contact with a company on Twitter or Facebook, rather than a website. It’s much easier to find a business on social media than it is to find their website, search for a contact page and then fill out a contact form and hope for a response. On social media, there is no doubt that the business received your inquiry…and it is public for all to see. Social media makes customers feel like they have power. Your audience and customers have also begun to expect brands to rapidly respond to online complaints. A slow response time or a badly handled response can mean doom for a business, and savvy businesses understand the importance of this aspect of customer service. Because of all these reasons, it is incredibly important for you to Create a Social Media Plan. If you have never created one, the task of getting started may seem staggering. But, by taking small steps every day in crafting a social media marketing & customer service plan, you will be up and running before you know it. Who is the audience for your content? Create a persona. Who influences my audience? What social media platforms do they use? What kind of tone would this audience like? Educational? Funny? Serious? What other places besides social media does my audience like? Choose Three Social Networks: Now that you know your audience, pick between 2-3 social networks they frequent. You can always expand as time goes on, but understand that your brand does not have to be on all social networks. Everyone thinks they have a goal. Not everyone does. If you haven’t already, actually sit down to write it down and discuss it with your team. You may be surprised at what you come up with. Then, make sure that this goal is discussed prior to every campaign that you put together. Ask your team and community managers to place this in a prominent area so that it can be thought of every time a social media post is created. This will help you and your team stay on track. You may have more than one goal…in truth, you will probably have about three of them. Make sure that each goal is achievable, that you can measure this goal, and that it can be achieved within a time frame. These are just a starting point and will point you in the right direction. AKA – Time to do some spy work. Make lists of industry leaders, competition, and your customers/audience. Check out what they are talking about and what they are posting. This will give you a good idea on the tone of voice you need to take, and what is relevant to your industry. See what is performing well for them and take inspiration from it. You’re probably going to be sharing content you own as well as content from others. If you’re going to be sharing your own content, this is fantastic. Driving traffic to your website or blog makes it much easier for you to track your ROI. If you don’t already have a website or blog, start one. Then, once you’ve created that content you can begin to repurpose it. Add that content to your newsletter. Craft social media posts – alter them to fit the voice of the platform. Create a video- share to social media (including Youtube and Vimeo). You can do the same with content from influencers…just make sure that you credit the source properly. Photos receive more engagement than links, or text-based updates, but lately, video gets the most engagement out of any type of post across social networks. The above tweet was very carefully crafted. It received a good number of retweets because it included a deal, a gif, and clean easy to see graphics. Make sure that on all your social media sites your bio sections are current, consistent and accurate, including avatars and text. This is all about consistent branding and a consistent message. Think about keywords so that you can be found when people search. There is no “best time to post” on a particular network. Each brand and business is unique and has its own audience. If you really want to know when is the best time to post to social media, check out analytics. We suggest you use the times suggested by each platform to get started and then test different times to see what works best for your brand…or use a social media tool like Socialdraft to schedule your posts and pull reports to see what performed best. Twitter – you can publish as often as 14 times per day, never more than once per hour; seven times per day on weekends, from 3:00 a.m. to 9:00 p.m., roughly every three hours. We suggest you craft 3 pieces of scheduled promotional content. The rest of the posts should be engagement posts. Then spend your time engaging your audience in conversation. You will get the most ROI from Twitter by engaging. Facebook – 1-2 times per day, seven days a week. Many sites will tell you that only once a day works…but just think about your audience. They may not all use Facebook at the same time, this is especially so if you are a national or international brand. Check your insights to see when your audience is engaging and begin to test out to see what times get you the best engagement. Instagram – You can post up to 5 times a day on Instagram…but again, this is only if your content is up to par. This is usually way too much for most accounts. If you are just getting started, you are better off posting once a day until you build your audience. Once you have a healthy engagement, then you can begin to test out posting twice daily. Pinterest – Post once a day until you’ve built your follower base, then increasing the frequency. Pinterest is a strong network for driving web traffic, so each pin is a great link back to your website. We’ve seen brands do quite well posting 3 times per day. Tumblr – 1-3 times per day is the recommended frequency. Some brands are able to get away with more, but if you’re just starting out, keep it to no more than 3. It is imperative that your content fit the demographic or you risk losing followers. With Socialdraft’s “Drag & Drop” calendar, you can schedule posts to Facebook, Twitter, Instagram, Pinterest and LinkedIn with just a few simple clicks. Re-scheduling and editing is a breeze. Simply drag & drop. You can also duplicate posts for later posting. We suggest giving some time between duplicate content so that you don’t bore your audience…and so that your messages go through. 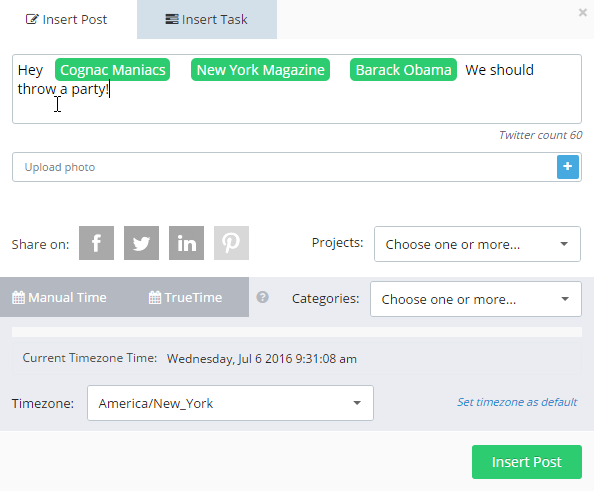 You can also put all your evergreen content into a CSV and upload it directly to the Socialdraft dashboard. Edit the csv monthly and upload again to save tons of time. This is fantastic for holidays, reviews, and evergreen information. And with the Socialdraft Feed you can manage, comment on, like, and take more actions such as re-tweet items from all of your social media channels. It saves you from logging on and off from multiple social networks. You will need to measure results in order to see if you are being effective or if you need to sit down and re-tool your marketing plan. An easy way is to pull social media reports. If you’re short on time, you can measure followers/following, demographics, and engagement. If you have more time, dig down on each social network to see what posts got you the best engagement, how many times your content has been shared, and how much traffic was driven to your website through social media. This plan should put you on the right path to social media marketing. One of the biggest complaints we heard from Social Media managers while developing the Socialdraft dashboard was how cluttered and hard to work with social posting options were. Our main goal when creating the Socialdraft scheduling and posting tool was to make it easy to work with, and easy on the eyes. Today, I’ll walk you through the Socialdraft calendar features, which include a nifty Drag & Drop re-scheduling option. 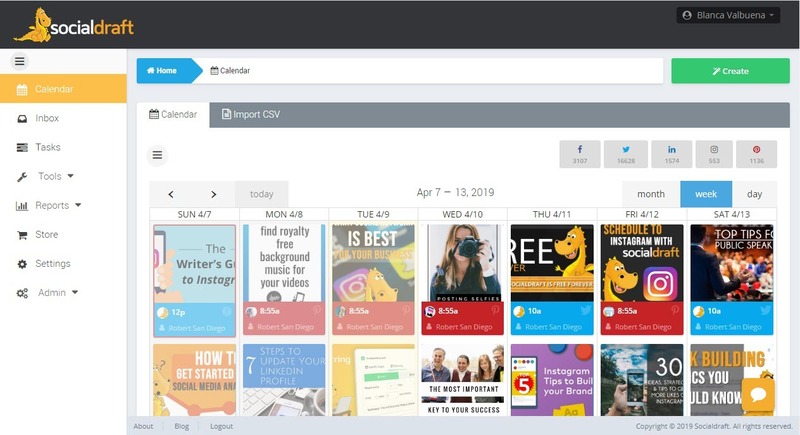 The Socialdraft Drag & Drop Calendar allows you to schedule your posts ahead of time (either via CSV or simple posting), easily re-schedule posts with a simple drag & drop action, recycle effective posts, AND craft interactions for multiple social networks (and multiple clients), all from one place. With Socialdraft, the ultimate goal is to help anyone who manages social media pages and those who work in teams to schedule and create content, interact with their community, and do it all smarter – not harder. In a previous article we explained the main features of the Socialdraft social media tool. Today we’ll discuss features related only to the Socialdraft Calendar. Socialdraft puts all of your content in one easy-to-read calendar. You will no longer have to spend hours a day surfing through each social media site to post reviews. Adjustments can be made via drag and drop. Super simple, super easy. What Social Networks Does the Socialdraft Calendar Work with? How Many Social Networks Can I Manage On Socialdraft? You can start with as few as 5. Our Team Business level allows you to manage up to 100, but…if you have more to manage, just email us. We can create a custom package for you with as many as you like. To access the Socialdraft calendar, simply log on. As soon as the page loads, you’ll be looking at your social media calendar. On the calendar, you can see everything you have scheduled on all of your social accounts: Twitter, Facebook, Instagram, Pinterest, and LinkedIn for multiple accounts. What do the Colors Mean on the Socialdraft Social Media Calendar? The calendar is color-coded by Social Network. For example, the light blue posts are for Twitter, red posts are for Pinterest, and green is for tasks. Posts that are dull have already been posted in the past. Social Network: Facebook, Twitter, LinkedIn, Pinterest, Instagram. Social Account: You can filter by just one account. 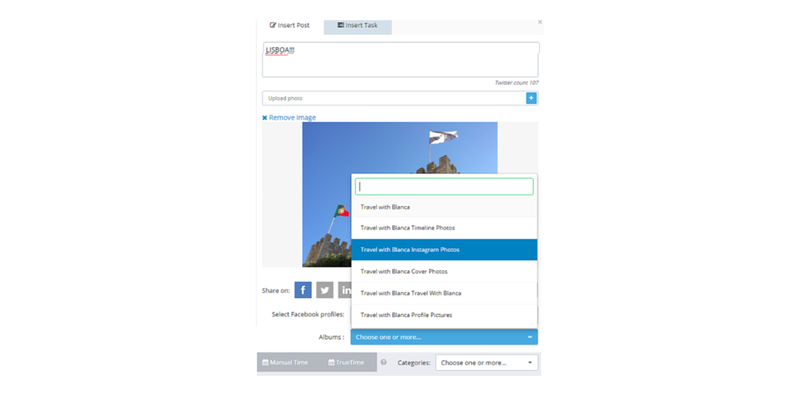 Social Campaign: Or you can filter by a group of accounts. 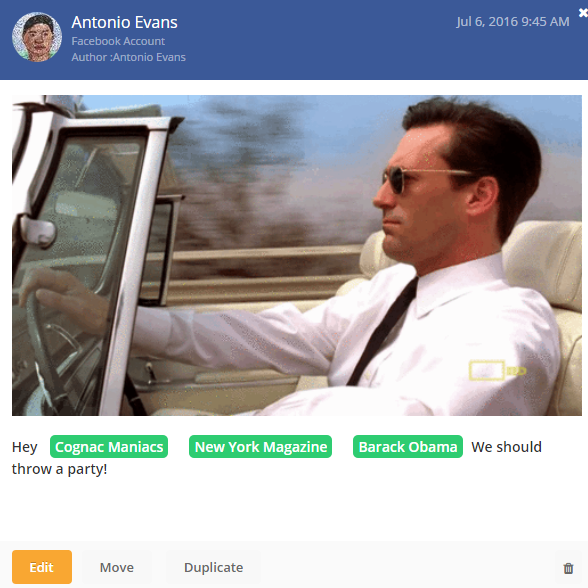 Social Category: Categories you create to organize your posts. SubUser: By the person who created the accounts. Keyword: Need to find a post that you know contains a particular word? Use this option! click and drag the calendar entry to a new date, and you’re done! You’ve duplicated that post. You can also click on the post and click “Duplicate”. Then select the date and time you want to duplicate this post to. Just a small reminder – on Twitter, duplicate posts cannot immediately follow each other, so make sure to space them out. Drag & Drop: If you’re in a rush or just want to quickly get something off your calendar to another day, click, drag and drop. If you want to re-schedule to a particular date, then click the post. Then click “edit” to edit that post (or in the case of a recurring post where you want to change all the posts in that sequence – click “edit all”. Then make the changes you desire. Social media platforms allow businesses to market their products and services in digital communities and networks where individuals share, discuss, and co-create generated content. But properly managing multiple social media networks like Facebook, and others including Twitter and LinkedIn, when promoting your business would be virtually impossible if not for programs such as Socialdraft. Our goal is to make your life easier. If you’re curious about Socialdraft, take us for a risk-free trial. As you probably know by now, Socialdraft works on a three week release cycle. Whenever a user sends us a request for a new feature, these get put into the development schedule under one of these three week cycles. Today, we’ve released a few requests from some of you. If you have a request for our team, simply click on the support area on the bottom right hand corner of our site, and let one of our reps know so they can submit it for consideration. Best of all, there is no increase in pricing with any of these features, so you can enjoy them at all membership levels. *****One thing for those of you using Socialdraft. When you first log on, clear your cache. This will ascertain that everything works properly. Check out the video below to see the updates to the Socialdraft Calendar in action. This feature was requested by Jacqueline. She wanted to be able to tag all the business pages across her organization. It works pretty simply. This works just as it does on Facebook. Simply type the @ symbol followed by the page name. Socialdraft will do the work and find the page for you. You will know the page is successfully tagged when it changes color(the page name is highlighted) as seen in the example above. We figured while we were at it, we also work on tagging fans, so that feature has also been pushed out during this release. Bigger is better, especially when you are checking out your social media posts and when you need to edit them. That’s why previews are now big, huge, ginormous. Thanks for the suggestion Carrie! How awesome is that! You can schedule gifs to both Twitter and Facebook on the Socialdraft dashboard. And by Facebook we mean you can schedule gifs to your personal account, your Facebook business pages, and groups you manage. A great way to increase your engagement. This one was not a suggestion, but gosh darn it, we love gifs, so we did this one for ourselves. How to Schedule a gif To Twitter: Simply upload your GIF as you would a regular image. How to Schedule a gif to Facebook: Facebook does not allow direct uploading, so you need to use a link. Click here to start your risk free Socialdraft trial. And check back in three weeks for news on our next release. The final update we have added is that you can now associate your Facebook image posts with a particular album. How neat is that. The odds are pretty good that you haven’t yet created a social media calendar for your business – you’re not the only one. In fact, the overwhelming majority of otherwise smart and savvy business owners out there probably don’t have any kind of marketing calendar created for their business. For one reason or another, 99.9% of all businesses (small businesses, anyway) market and advertise by the seat of their pants. They just kind of throw something – anything – out there and hope for the best whenever it comes across their mind. But there’s a reason why some of the biggest and most successful businesses on the planet have calendars for absolutely EVERYTHING. They have game plans for the weekend, the month, the quarter, and the year ahead (sometimes multiple years ahead), and if you’re going to compete these days you’re going to want to figure out how to create a social media calendar as well. Hopefully, this quick guide will be able to help you out! Just about every single business today can benefit from a focus on social media marketing. Tools like Facebook, Twitter, Pinterest, LinkedIn and Instagram (to name just a few) have the potential to help you gobble up a tremendous amount of influence in your market without a lot of extra effort – and no real monetary expenditure – but you need to know how to use social media efficiently. Besides, if you are just posting willy nilly, it will make it much harder for you to go back and analyze what worked and what didn’t. You also need a social media calendar so that if there is an untimely event that requires you to move/reschedule certain posts, you can do this with ease. That’s why you need a social media calendar. You’ll notice that some of the most successful businesses on the planet – and certainly some of the savviest marketers out there – seem to release posts on a regular drip feed, almost as though they had planned the whole thing out. Well, that’s because they almost certainly have created a social media calendar. By planning out all of their social media efforts they are able to put their social media marketing almost on autopilot, giving them the almost unfair advantage of being able to focus on other areas of their marketing and advertising while their competitors really struggle figuring out social media. When you figure out how to create a social media calendar of your own, you gain the same almost unfair advantage! The process for figuring out how to create a social media calendar is much easier than most people would have ever expected. You’ll just need to sit down and think about what you’re trying to achieve with social media and your marketing in the first place. You also need to take current events and holidays into consideration. Finally, come up with a regularly scheduled plan that allows you to drip specific content pieces almost on autopilot. You can break this down into specific days for each platform release (Facebook on Monday, Twitter on Tuesday for example), or you can break it down into the kinds of content that you’ll publish on a regular basis – one week pushing blog posts, another week pushing pictures and video, and mixing and matching as necessary. Once you’ve figured out the types of content you want to push out, and when, you’re going to start scheduling. Promotional posts – do you have any promotions or releases coming out? Memes & Engaging content – this is your content that educates or entertains your audience. At the end of the day, figuring out how to create a social media calendar that really works for your business and your specific operation is going to come down to figuring out your specific needs, your specific goals, and how you hope to leverage everything social media brings to the table. All things considered, there is a tremendous amount of opportunity for smart and savvy marketers to cash in on everything that social media has to provide. When you use the different platforms intelligently – with your social media calendar leading the way – you’ll be able to put your advanced marketing efforts on autopilot and focus on other areas of your business without dropping any results along the way. It really isn’t going to get any easier than this, so build your social media calendar today. The best part is that you can build your social media calendar right on our dash – because it is a calendar. So we make it super easy for you.